In a blog post titled Art Malls, I called artists out for building other companies’ businesses instead of their own. Too many artists are trying to sell art on rented property instead of owning their own store fronts. If you’re doing this, you look like an amateur. Period. Now, in many instances, that’s ok. If you’re just getting started, you have to start somewhere. But it doesn’t take much to get your own website up and running. The WordPress software is free, open source, and there are lots of tutorials around the Web to learn how to use WordPress effectively. Quick note: WordPress.com vs. WordPress.org. WordPress is a software that is free to use. WordPress.com is run by Automattic and allows you to easily set up a free blog with Automattic’s own stripped-down version of WordPress. What I’m talking about in this article is using the free WordPress software that can be downloaded at WordPress.org, or (more commonly) installed with a one-click tool at most common web hosting providers. There are lots of software tools out there, but WordPress is the most common and (arguably) the best. Here’s why you should use it for your artist website. It’s free. WordPress is open source software. That means that the people who made it did it because they believe in making awesome tools that do great things. Note: even though the software itself is free, you still have to pay for hosting. We talk about this in this webinar that explains hosting and this page that explains how to set up a basic artist website in 10 minutes with WordPress. You have all the control. Since you’re essentially building the website from scratch, you can make it look like anything you want. 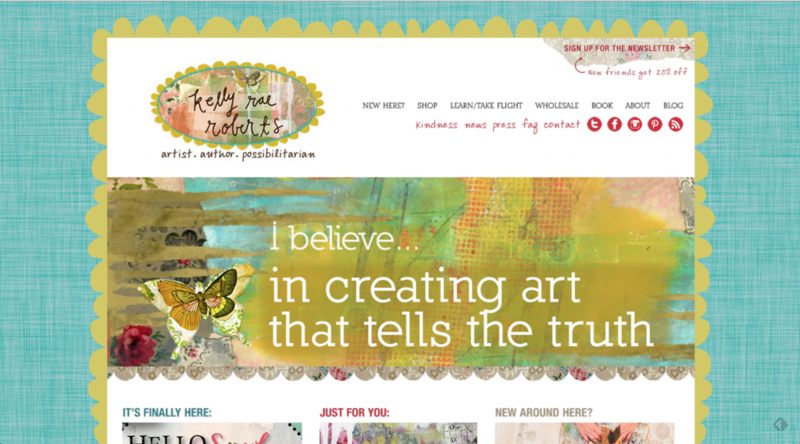 Below are some examples of great artist websites that are built with WordPress. There’s a lot of free help available. Because WordPress makes up about 20% of all websites, there are literally thousands of themes, templates, plugins and other tools that will make WordPress do just about anything you can imagine. We blog about it a lot here. You can Google just about any kind of WordPress problem and come up with an answer. Below are some examples of Artist websites built on WordPress. They’re really quite good, and took just a couple of hours to put together. SarahStone.com – Sarah is an artist, set designer, and all around creative powerhouse. Her website was built by The Abundant Artist’s Done for You Artist Website service, and created with the Divi theme (see our Divi tutorial & review). 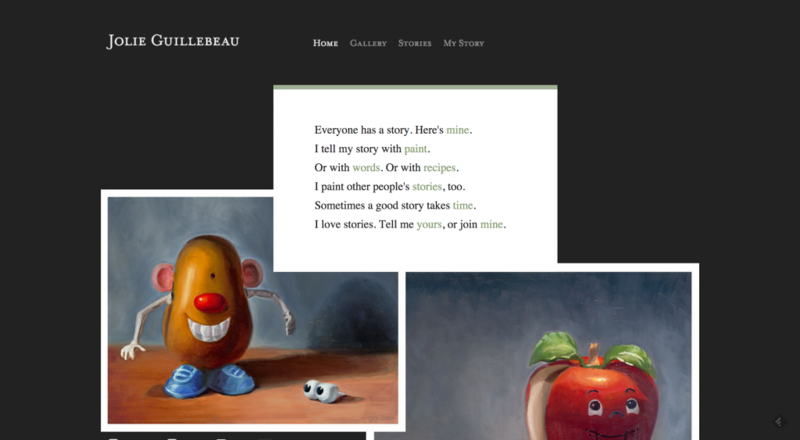 Jolie Guillebeau‘s website is fun, unique, and full of her daily stories. Why Don’t More Artists Use WordPress? They’re not aware of it. 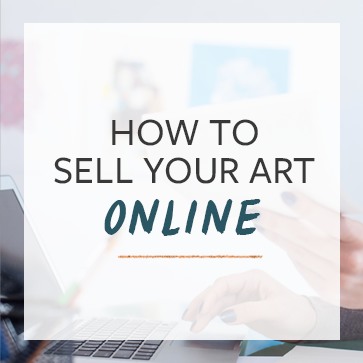 Most artists don’t spend a ton of time in the online world – well, probably not as much as me, at least, and may not have heard of WordPress. The thing is, hundreds of organizations from the very small to large companies like Wired, eBay, and CNN use WordPress. They think it’s too complicated. WordPress is easy to use. In this video, I show you how to get your artist website up and running in 10 minutes. It might take you as long as an hour. Displaying images. Personally, I’m a big fan of using ecommerce plugins to display your images because you can add Buy Now buttons right along with your images. Woocommerce is a free plugin you can use to set up your ecommerce. There’s also the popular NexGen Gallery which will create a gallery for your images. No time/Laziness. Some artists are legitimately busy with making and selling their art and don’t have time to learn how to build a site. If you need someone to build the site for you, check out the Done for You Artist Website special that I’m offering. I have a waiting list for new clients, but I’m happy to talk to you about your project. The major challenges with WordPress are load times and security. WordPress has notoriously slow load times if you don’t optimize your site and pay for good web hosting. Many artists opt to pay for cheap hosting through Bluehost, which is great for getting started, but not so great for a high-performing website that lots of customers use regularly. Regarding WordPress’ notorious security challenges: it’s not that WordPress itself is inherently less secure than other websites. It’s not. But it’s a popular target because WordPress makes up about 20% of all websites. WordPress can be secured if you simply take advantage of security plugins like Sucuri or use a web host that manages security like WebSynthesis (which is what TAA uses). So, if you aren’t using WordPress for your artist website, why not? I’m really surprised by this article Cory. It’s truly surprising to me that your experience hasn’t shown a wider usage of WP on artists sites. While I’ll agree that finding an appropriate theme for an artist can be a challenge (although articles on Smashing Magazine do an excellent job pointing you in the right direction for artists of all types) it really is pretty straightforward to setup and use. Personally I’m no where near the point where it makes sense to shell out big bucks for a totally custom site, so WP fits the bill quite nicely, freeing time that I can use to grow my business instead of worrying about coding or paying someone everytime I need something done on my site. I might suggest for the picture issue, I’ve found the plugin Shadowbox to be very cool. When you click on one of the pictures on my site, it shows the full size picture and darkens the rest of the screen around it. That particular plugin is supposed to do that too if you embed video in a post as well. And it’s the right price – free. Chris – thanks for the Shadowbox plugin suggestion. To be honest, I’m a little bit surprised myself, but there are dozens of ‘artist website’ companies out there that make a few dozen templates and then charge artists $10 – $30 per month. It’s a real money maker for them, and artists who don’t know any better think that they’re getting a great website. Hopefully this post will make the rounds and a few more artists will discover what’s possible. I am an artist in Nashville, TN and my website is via WordPress. I even use the suggested Bluehost to host my site and it has worked well. I might add that I am a creative, not a programmer of any sort and I am able manage the site just fine on my own. I used to have a Drupal hosted site, and it was not user friendly at all. WordPress is great! Why aren’t I using WordPress for my artist website? Already have website(s) for my art established so why switch to something new? (I did use the blog WordPress for awhile, but got tired of blogging…). Also set up an art store using WordPress via a self-hosted site, but was not satisfied with the resulting store using WordPress-available sources. Ugly and clunky to set up and use. I decided just plugging in PayPal “Buy Now” buttons was easier to work into design on est. websites. Great question C. Kaufman – if you already have an established website and it’s working for you, then no need to switch. I’m more talking to those whose website isn’t selling their work for them. Don’t get me wrong (or I did not come across too clearly), I think WordPress is great and recommend it to anyone who does not have a site already…PLUS those that have one and it can be made better using WordPress. There are some really great websites using WordPress. I am just waiting for an excuse (or new line of art) to start up a new idea for a website using WordPress. 1. It’s hard to find themes (either free or premium) that are fit for website formats rather than blog format. There’s no good list out there, nor is it particularly easy to find examples of pages actually using the theme. 2. I had him try out several themes, but he had trouble knowing just how much small tweaks in formatting would change the overall aesthetic of the design (in other words, when you don’t know how easy it is to move tabs, embed flash images, change widgets in sidebars, it’s hard to know the extent of what you need until you get in there and start playing with a theme). 3. As an artist, he had fairly particular desires in terms of both function & format of the site. Unlike a more traditional small business, he had a very clear idea in mind about how he wanted the design to *look,* and that the look had to be aesthetically pleasing. The difference between “five minutes to set up” and “actually liking what the website looks like and does” is pretty big. We finally settled on Atahualpa theme, which is great, but does in fact require some basic understanding of code. In short, I think artists want to use wordpress, and they’ve heard it’s a great platform, easy to use, etc; and there is certainly a desire to have updated content more often than what a traditional paid web designer can provide. But it’s a big step to go from having a designer do all of your work for you (even if it is only once a year), to having to understand wordpress (ie, what’s the difference between a post and a page? what’s the difference between a plug-in and a widget?, etc), the particular quirks of your theme, html, very basic css, being responsible for updating new versions of your theme, navigating the search for a domain name, server host, applicable plug-ins, where to find help online, etc. That said, the temporary pain is certainly worth the long term value! I can’t think of another platform that allows artists (or anyone) to do exactly what they need in so short an amount of time. Thanks for using my image, and I do agree completely on how people should use WordPress, not just for blogging or for showcasing art, but as a fully fledged website in itself. I am sure few sites out there have the beautiful user interface that WordPress has. I wish I had my own hosting, but even WordPress.com is extremely useful. Moufflets, your image is hysterically awesome. Thanks for sharing! WordPress is great for artists because one can upload images directly and change inventory quickly, w/out using Dreamweaver/html – or hiring someone to do it for you. As your subject matter changes, you can simply add new pages. If you are teaching workshops in six months, but aren’t now, another header can be added – simply put WordPress can grow with you without redesigning an entire website. Our trusty web person set it up for us and coached us through a very short learning curve for a minimal cost – any ‘mistakes’ made could be easily fixed. I cannot speak more highly about it. There are plenty of awesome free wordpress themes available for download. And you don’t have to be a designer / developer to simply change the graphic header in Photoshop and create your own logo. If you know CSS, even better. It’s not rocket science. You’d be surprised how unique you can make your theme with a little tweaking – and it’s FREE! I just wanted to plug a free theme for WP I’ve found that is designed specifically for visual arts portfolios: WPFolio. It’s really well designed, does everything I need a portfolio website to do, and has excellent support. It goes beyond many other themes in that it offers automatic thumbnails, Lightbox support for image galleries, and separate designs for news/blog posts and visual art posts. It’s what I’m using for my website, and I highly recommend it! I built a site for my artist client on WordPress, and I can tell you where the biggest challenge was. Your three examples above use standard thumbnails – they’re all the same size and they crop the images. She was determined that none of her images, even the thumbnails, be cropped, so she was unable to find a WordPress template that gave her the look she wanted. I think that an artist who’s starting out on WordPress would have to be somewhat flexible in the final result they want. If you know exactly where you want every element of your site and precisely how it HAS to look, you may need some (paid) help. If you will be satisfied with a great looking site built on a theme that is already configured for artist’s or photographer’s sites, you’ll be able to surprise yourself with how quickly and well you can build it all yourself. In reality, WP is easy to use, but, getting your domain registered, then getting your blog/site up on WP.org is a whole ‘nother matter. I set up a WP.com site for a friend, and it was easy. Do you know if it’s possible to put a link to an Etsy store on WP.com, or to a store in Imagekind, since it would be to something you created?? [Not an affiliate link.] Or would it be taken down? Ellie, you don’t ‘put a site up’ on WP.org. You download the software and install it on a server. I recommend signing up for Bluehost.com and using their automatic WordPress installation tool. The WordPress.com Terms and Conditions have the restrictions on content, but the short answer to your question is you can put up links to whatever you want, as long as it’s decent. Hello! I am an artist who uses both Blogger and WordPress. My site is infiniteday.wordpress.com if you are interested. I’ve used wordpress for my art project site for the past year, and it’s been fantastic (www.0001project.com). It’s incredibly flexible, and you add all kinds of functionality to it through plugins; from social media features to way of selling your art. I do have a background in graphic design and web design, but even someone with just basic technical skills can set up a basic site. I’ve made my site for my oil paitings and drawings with WordPress. I wasn’t very easy but very satisfactory when it works. I’ve used the template ‘Locus one page’. I created a way to paint the one and only headless horseman. Worth checking out IMO. 🙂 I will definitely be using wordpress for it as well! Hey really great post. I have a wordpress blog. I mean it’s ‘hosted’ and all, but it does follow the awesome format that wordpress provides. I’ve found a lot of cool people on this site so far. Anyway, if you feel like hitting up my wordpress blog, it’s http://www.PurAbstract.com. There’s quite a lot of idle banter on there so it’s still a blog. Kudos on this post though! 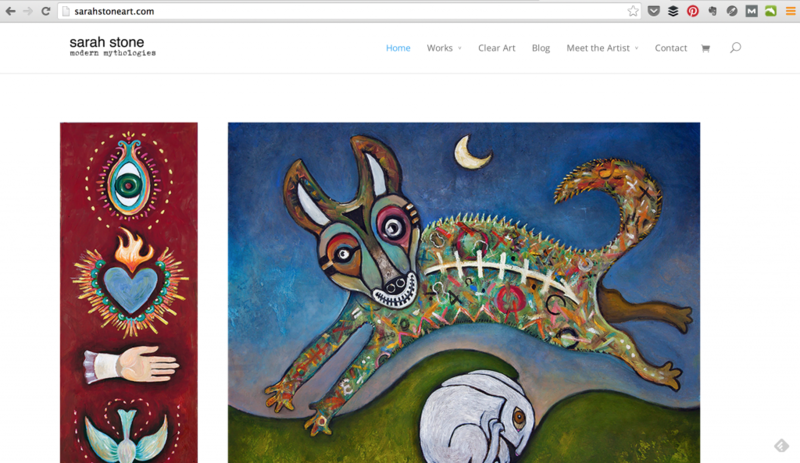 We’re using WordPress for Dotty Art ( http://www.dottyart.co.uk ) with the Photocrati theme – easy to set up, no programming needed, e-commerce out of the box. I’m and artist and I use WordPress for my site (www.roxroller.com) and for most of the sites that I design which can be found on my site for some examples! I love it, very easy to use and affordable. hi there. Great post (I am getting to it a bit late). One questions if still possible to ask…. Is WPfolio the only wordpress theme that can do this (make a blog platform look like a website) or do most of them have these features? And if so, what is it that we should be looking for when choosing a platform. thanks. Hi Jo – there are many, many themes that will do this. I offer WordPress setup as a service, or you can simply find a theme that matches your needs. I coded my first website by hand – then learned css and coded the second one, again by hand. At that point I added a WordPress blog side integrated into the website hard coded part. The third version was WordPress as the core and backend. Content stays the same, the styling and functionality can be dramatically changed and revised as needs and obsessions change. I did it because I am convinced presentation is part of the communication that is art. Payment gateways are not free. Sorry. I think you are absolutely right. WordPress is so wonderful and (almost) easy to use. Most artist cannot keep their Website updated because they do not have time, the knowledge and cannot afford to paid somebody to do it. I called site ground. They said ohhh yea we don’t know about wordpress.com at all we don’t provide hosting for them…………? SO. How can I migrate my domain to wordpress.COM? Answers would be forever appreciated. what would be more helpful than an article about wordpress, would be an article where one could buy or make a complete wordpress e commerce website with different picture sizes, prices for the sizes that would automatically show with a shopping cart. Hi Russ – I’m working on a video just like that. In the mean time, you can visit http://woocommerce for their free WooCommerce plugin for WordPress. The sites are great. Easy to set up and look good. The problem is, to get the site noticed takes a ton of work and for most artists this is a time-consuming distraction well outside of their comfort zone. I think there should be more collaborative efforts to help artists get noticed. What did you have in mind Barnabee? What kind of collaborative effort? Nice to stumble upon your site. I’ve been evangelizing for WordPress for quite a while, for most of the reasons you give. Most of the sites I’ve put up have been for artists and the main requirement has been how to present galleries of images — preferably in simple, orderly rows and columns. The only useful tool I found was NGGallery, although entering the caption info (title, medium, size, price) is really absurdly clunky. But, in the last month or so, NGGallery stopped working right; the columns and rows are messed up and fragments of html appear and push off other content. So, I’ve been nudged into another search for a way to present the artists’ work with some other plugin or maybe even just WP. I wonder what your state-of-the-art method would be for this purpose? I love your great, clearly given advice re WP. I checked out BlueHost. It looks like there is a hidden “pay per click” scam in this host’s “agreement.” Is this all a scam? Hey Nina – Bluehost is not a scam. They are a legit company that hosts thousands of sites. Not sure what you mean. Thanks so much for this post. This is the one that really got me started on building my WordPress site. I am currently just learning about wordpress – I hired someone to build my first website, and am now constructing a new one from the ground up. It is actually really easy! awesome Robert! Let us know how it goes! I am an artist and I’ve just started a blog on wordpress. I think there are some cool themes for artists (though I am not using any of the arty ones right now, but I plan to.) One of the disadvantages of using wordpress is that you can’t embed Flash animations in it. So is isn’t useful to animation artists. As a caricaturist, I don’t need to display animations, so I think it’s going to work for me. I was just wondering if anybody knew what theme Jolie Guillebeau one of the website examples at the top of the page is using? i’ve been using Divi and cannot accomplish the simple clean look as hers. Hello, I’m after some advise please. I have 2 wordpress sites (initially set up by a developer) which I’ve always found very difficult to use. The second site I’ve been trying to set up for around 4 years (on and off) but have trouble finding anyone to help. It’s a very basic site (no ecommerce) but I just need a portfolio. As an artist I would like it to look and work a certain way. Developers say it will take up to 4 days and yet I’m wanting something similar to the video above. I can’t do it myself. I’ve been trying for years as I said and to change one small thing takes many hours of research and trial and error. I personally wish my developer had never suggested started my sites as WordPress sites. I had used other platforms in the past that I found very easy and intuitive but WordPress for me is very convoluted, difficult and time consuming. Nonetheless I’m stuck with it now and need someone to reconfigure my Portfolio which should take an hour as suggested and not 4 days? I’ve spent weeks trying to find someone to help. Do you have any suggestions as to whom I can contact please, thank you. I’m an art student and I found that it’s very difficult for me to be active online. Especially, the online site in the blogging platform which makes it harder to interpret my arts. Thank you for the advice ad tips, I think I’m going to do well WordPress. I’ve been looking around for an affordable way to switch my online portfolio design from Dreamweaver. This may be it. My computer keyboard failed and I am no longer able to use my very old Dreamweaver software. My new option with Adobe and my new computer is to rent the software by the month. I will not do that. I currently have a web hosting with Go Daddy. Can I use WordPress as my developer and then upload to GoDaddy as I did with Dreamweaver? Will all my files be both on my computer and on GoDaddy? Thanks for your advice. This is a great resource. Have you found any art inventory plugins for WordPress that are affordable and easy to use? One of the biggest drawbacks of using any generic site provider is figuring out how to integrate your site with inventory management and ecommerce. The last thing I want to do is triple my efforts by uploading my images to three provider sites, and have to maintain them in all three. There are huge benefits to having an inventory system that integrates with your website and your webstore. The $ I spend with my inventory service are well worth my extra time in the studio.